The Michigan Crossroads Council Camp Stewards program offers you a unique opportunity to provide financial support for any one of our Michigan Crossroads Council camps. The mission of the MCC Camp Stewards program is to unite people who care deeply about our camps and are willing to financially support them. While our current funding sources provide some of the needed revenue for the maintenance and development of our camps, the MCC Camp Stewards program can help ensure the long-term viability of our camps and the development of our property and programs. MCC Camp Stewards can also guarantee the “pride in ownership” of volunteers and friends of Scouting. 100% of the Camp Stewards funds raised will be used for (1) program supplies and (2) building and maintenance supplies at the camp of your choice. A donation to the MCC Camp Stewards program is in addition to, not in place of, your annual Friends of Scouting gift to the MCC Field Service Councils. To donate to any of the MCC Camps through the MCC Camp Stewards program and help our camps and their programs, please follow the appropriate link below. 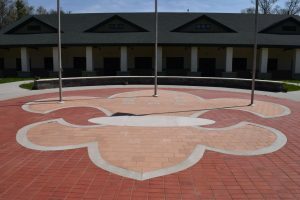 Buy‐A‐Brick and support Gerber Scout Reservation all the while having you brick or a loved ones brick engraved and installed into this Flag Field at the entrance to Ralph K. Merrill Centennial Dining Hall. This is not only a great way to support camp but to also have an everlasting memory placed at Gerber Scout Reservation.